Did I mention we’ve bought a sofa? We bought a sofa! 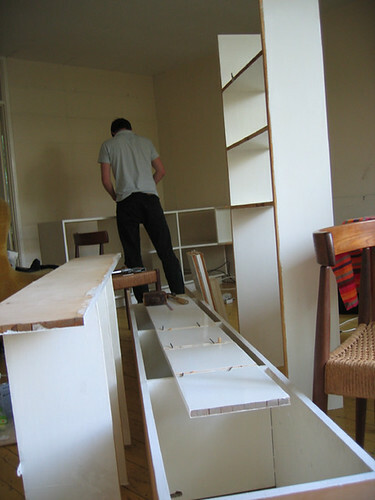 It only took *TWO YEARS* to find one we both liked, and it’s arriving in two or three weeks time, which means it’s actions stations as we finally dismantle the built-in shelving (that I hate) and sand the floors. Yes apparently sanding the floors is eval and horrible and no one will ever do it again, but the yellow we moved in with is scratched and scruffy and won’t go with the new brown sofa <3<3<3 and thus needs getting rid of, and being replaced with lovely varnished floors. So that’s my job on friday! (and saturday). 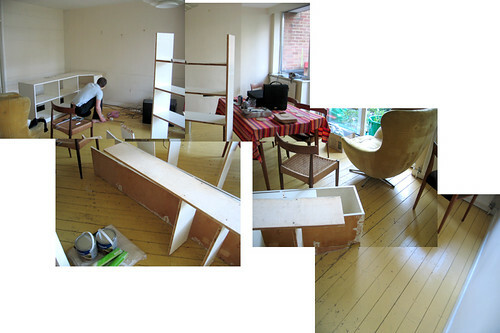 In the meantime take a look at the remains of the built in shelving. It was humungus! Too big, and with shelves that were far too deep and thus became clutter magnets. So all the books and pictures are stashed throughout the rest of the house, and we’re getting ready to finally start sorting this room out. Now we just have to work out what to do with all this wood! blimey, that’s an awful lot of wood. i can imagine that W will find a use for it and at least you have the garage to store it in. and how much bigger does the room look, eh? good luck with the sanding!